Not only can you purchase your trees from us, but we can deliver them to your home as well, and/or install them! Our qualified and experienced tree installation professionals can help you pick just the right spot for your new trees, so that you get the maximum benefit from any of the trees from our working tree farm. If you prefer, you can come straight to the farm, pick out your tree, and we can ball it and deliver it to your home so that it is ready for planting. 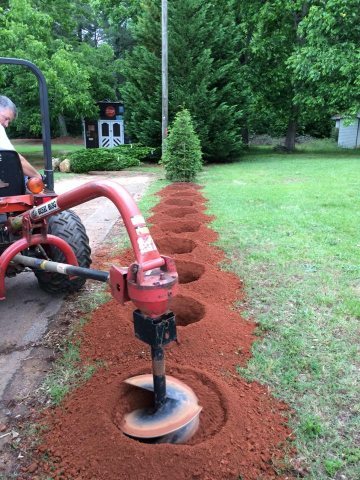 We recommend that before digging for the placement of any tree, that you have your utility lines clearly marked so that you are not digging near electrical or plumbing work, cable tv, or gas lines, as these can be a hazard when digging-- or at the very least can create a nuisance in your home. It is also better if you do not plant trees near plumbing or sewage lines, as over time, the roots can interfere with those and create plumbing issues in the home. We have machines that dig our holes for us, or--- we can hand dig the hole for you.